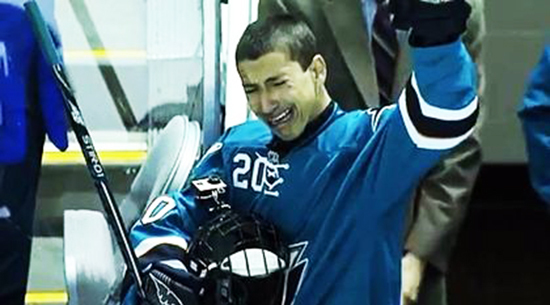 Sam Tageson, the Inspirational Hockey Player for the San Jose Sharks, Will Receive an Upper Deck Rookie Card! A NHL® rookie isn’t really an actual rookie until he has an Upper Deck Young Guns Rookie card however. When Upper Deck heard about Sam’s story, we moved quickly to create one of these special Young Guns Rookie cards for him. We will unveil the card to Sam Tageson at a special event taking place on Sunday, June 1 at 1:00 p.m. PST at Stevens Creek Sports Cards in San Jose. 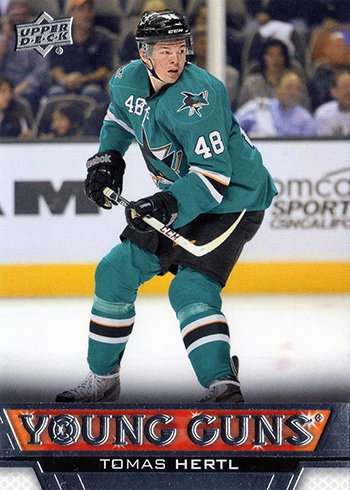 Sam will be autographing copies of his Upper Deck Young Guns Rookie card at the event and accepting donations for the Make-A-Wish Foundation and the Sharks Foundation who helped make his dream come true. Upper Deck will also be contributing a variety of exciting memorabilia, limited-edition trading cards and promotional items for a special giveaway with fans that day. Don’t miss it! Hockey fans everywhere fell in love with Sam Tageson and his inspirational story when the San Jose Sharks signed him to a one-day deal. Now Sam will have his very own Upper Deck rookie card to remember the experience by! Move over Tomas Hertl, there’s another hot rookie for the Sharks this year and his name is Sam Tageson! While Sam’s day was incredibly memorable, we are happy to create a collectible that will help sports fans remember Sam’s story. An extremely limited number of these cards will also be inserted into 2014-15 NHL® MVP late this summer. More details to come! Were all proud of you Sammy!